Ouch, $160 to get my car back! Flew back to Portland to pick up from where we’d left off. 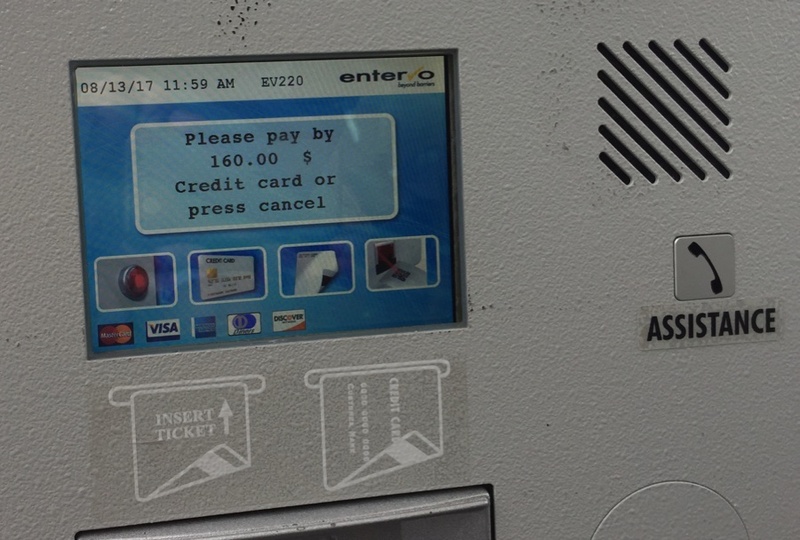 First pain was getting the Subaru out of “economy” parking, $160 for 18 days of absence. 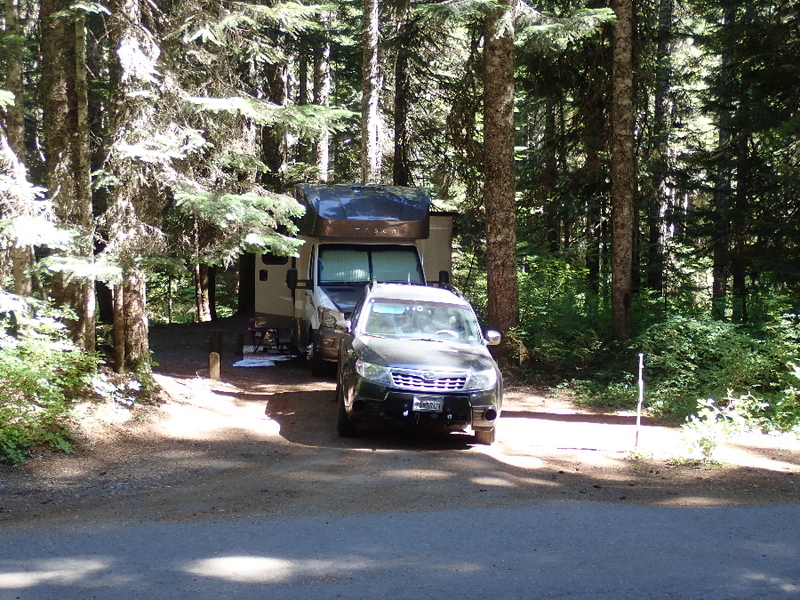 But the RV was OK, a tad more dirty but fired up OK and we spent our one and only night in Portland at Columbia RV Park. Classic parking lot style spaces, an overloaded WiFi that did not work and plenty of jet noise from the takeoff path of PDX. Nice bathrooms and we cleaned up for our next stop on the slopes of Mt Hood. Had dinner at a Mexican restaurant overlooking the Columbia River and the I-5 Bridge originally built in 1917. 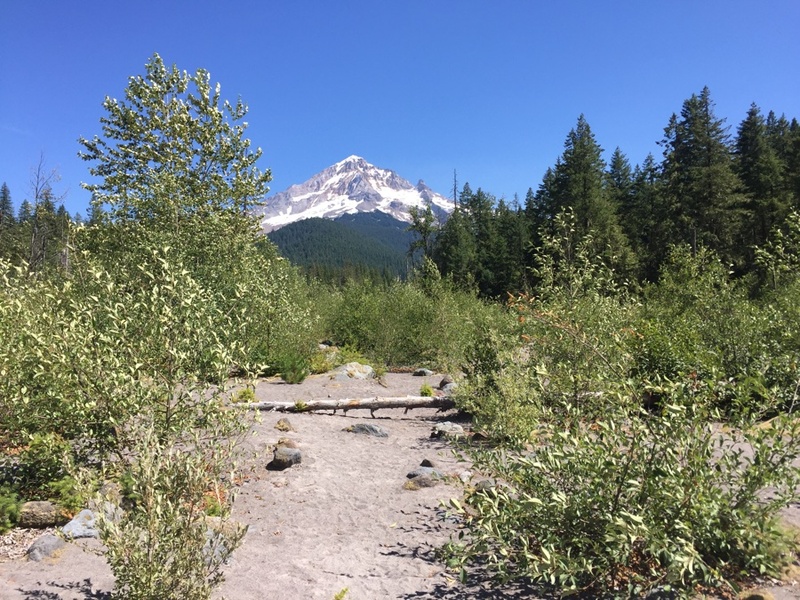 Drove the “long” way round to Mt Hood via Hood River and then down to the Still Creek campground near Government Camp. 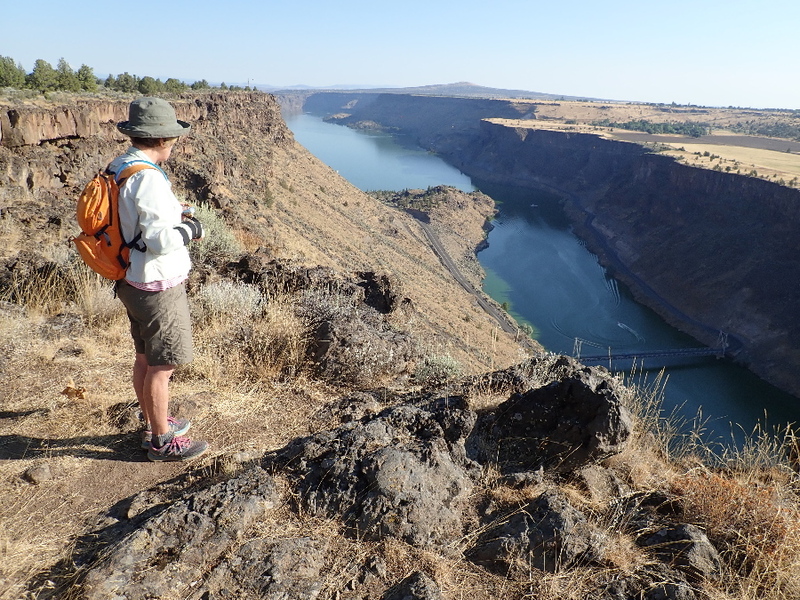 Had planned to do a hike up to the PCT and left to the Palisades Loop. Drove up to the ski area to look around and get a lay of the land. 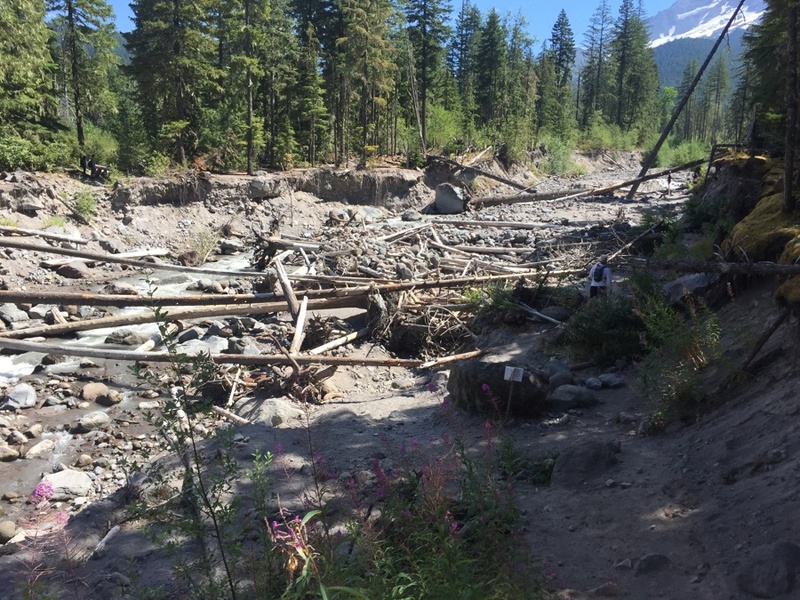 Inside the lodge were signs saying the Palisades Loop was impassable due to fallen trees and another about closures due to the many wildfires burning. Not looking for trouble I went to plan B which was the Forest station in Zig-Zag a few miles down the road. The lady downplayed the fallen tree story and said the fires were not in the local vicinity. 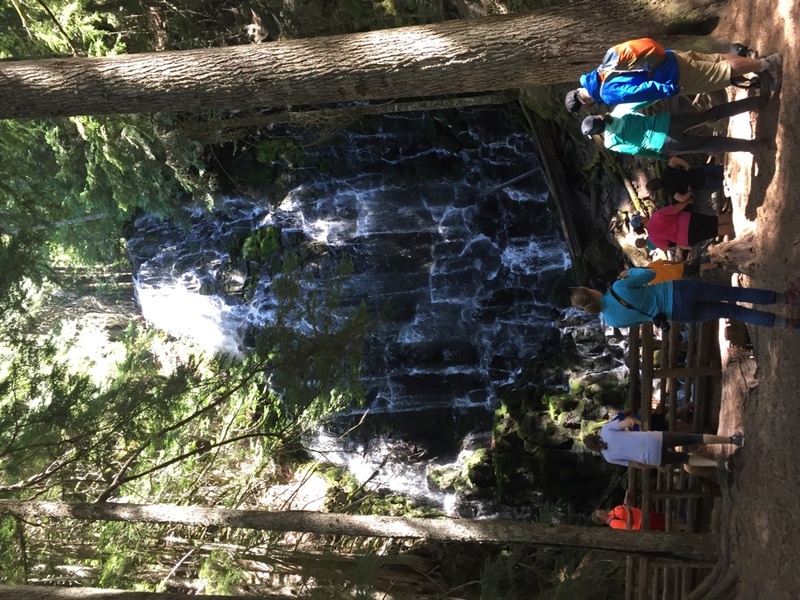 Suggested Romana Falls and Mirror Lake as alternatives. 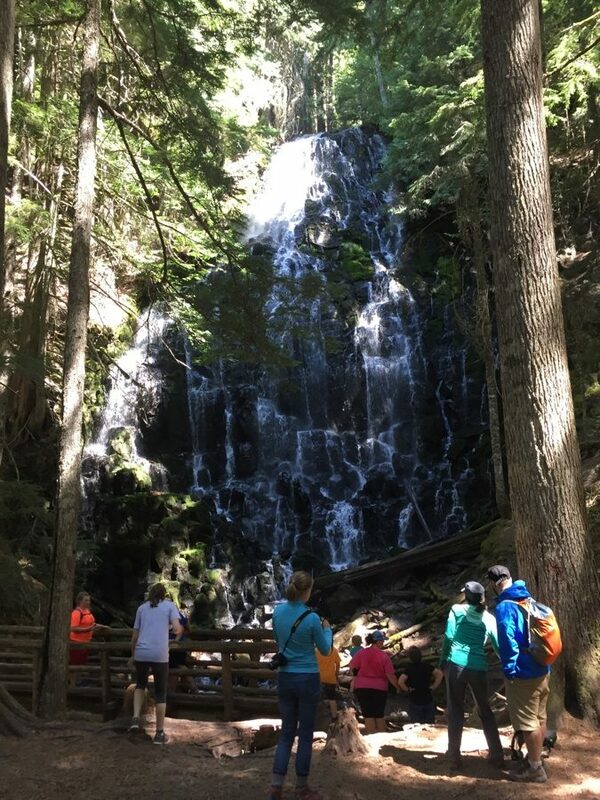 We chose the local Falls trail even after being shown a photo of a downed tree infested river crossing. Start of the Romana Falls hike, can’t get away from the Hood. 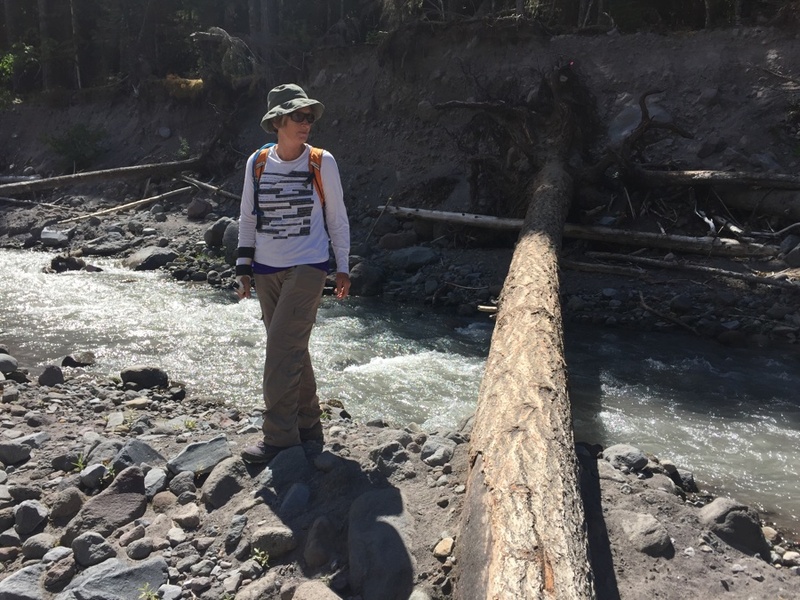 That’s the log we eventually crossed by. I dare not show any photo’s of what I made Rose do to get to the other side lest I get disowned by her family. Suffice to say we made it safely both ways. Over the creek and back down the other side of the loop trail. 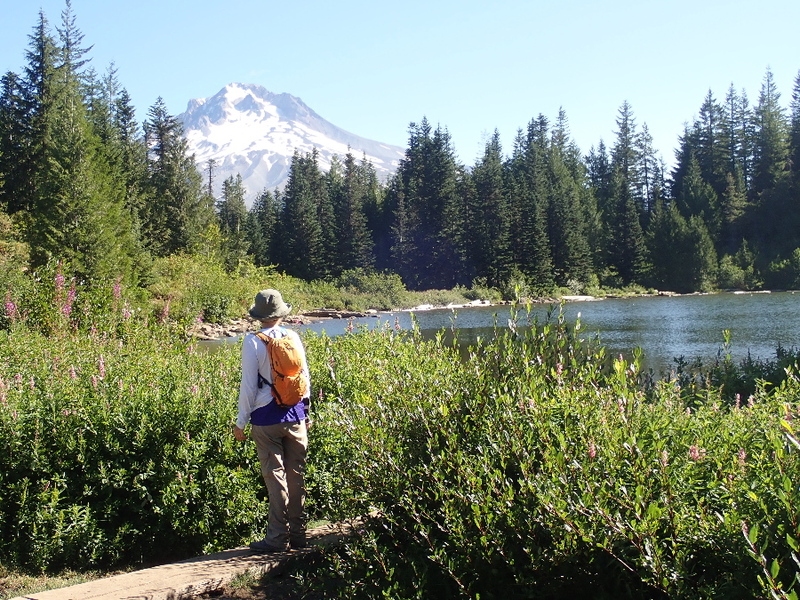 Next day we picked Mirror Lake and the ridge behind it, also about 7 miles and nearly 1,000′ of gain. 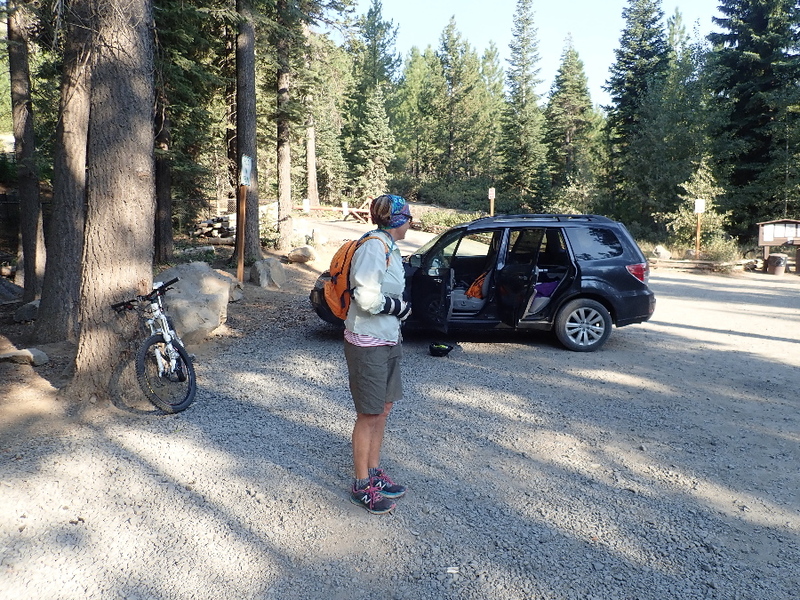 The trick here was the limited parking at the trail head but we found a spot after a quick stop for a breakfast of coffee & pastry in Government Camp. Yes, that is the name of the town and I still find it difficult name to comprehend. Nice views all around from the ridge. 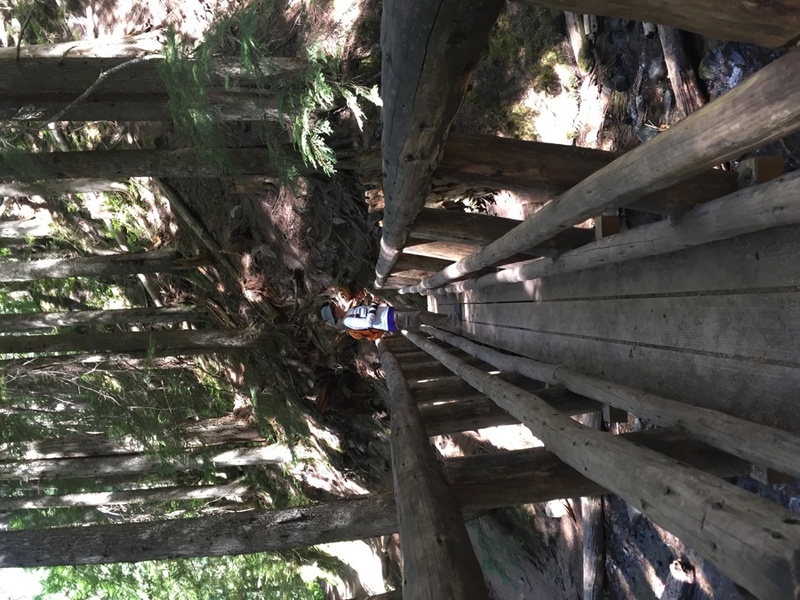 Still Creek campground – way too much shade! Our $10 per night (with 50% discount) was a bit too shady for my liking. It was the first time we had to run the generator to charge the batteries even though we had solar which it pretty useless when the sun is obscured for 23 of the daily 24 hrs. After 3 nights it was time to move, down to our eclipse destination at Cove Palisades State Park. Drove down Hyw 26 to Madras which was already showing signs of activity four days before the event. 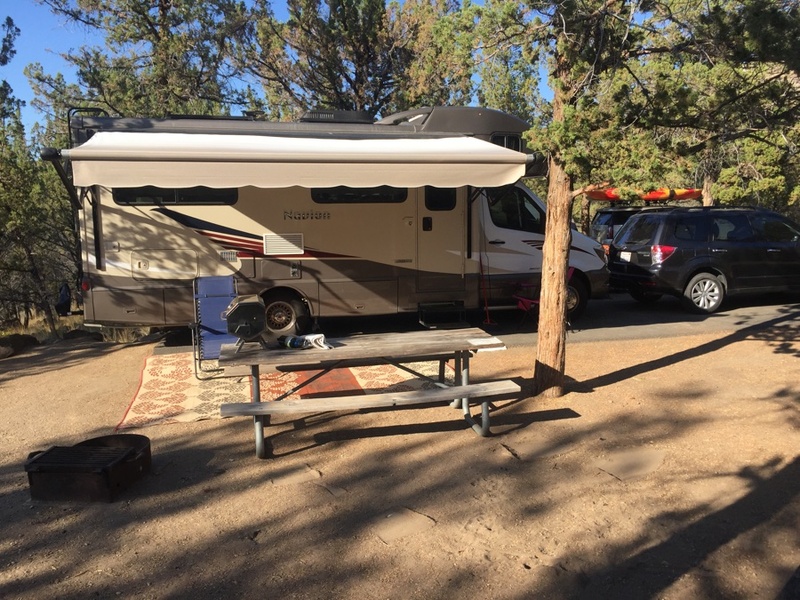 Bypassed Safeway grocery store and went straight in search of our RV’s resting place for the next 5 days. 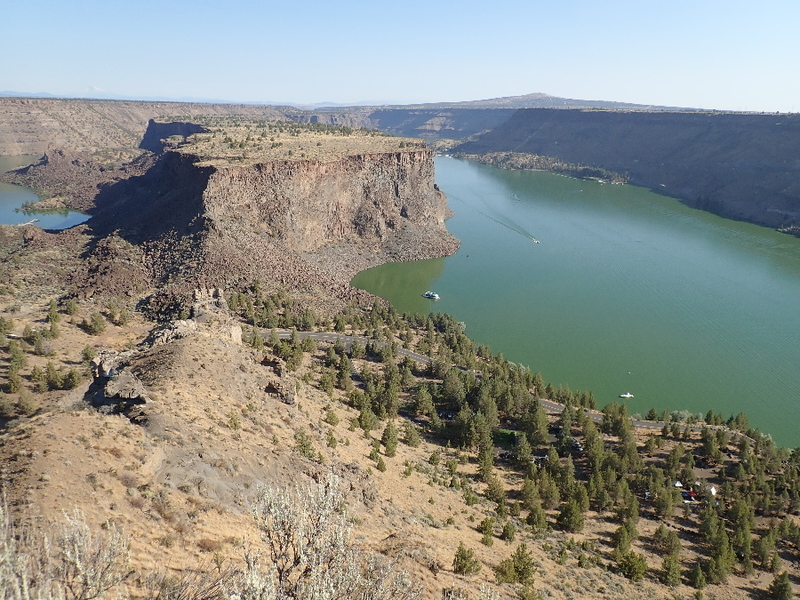 Cove Palisades campsite for the eclipse. 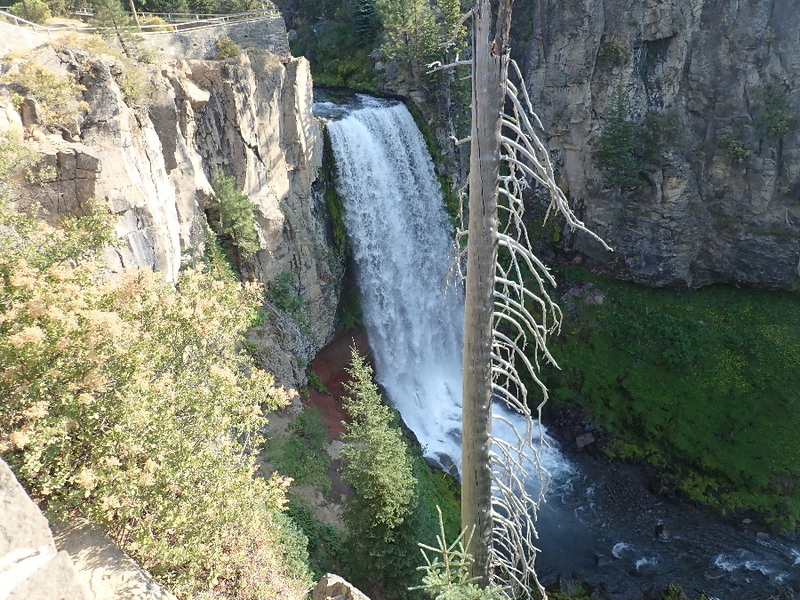 Friday, the eclipse is on Monday so we decided to investigate south to the Deschutes Forrest near Bend. 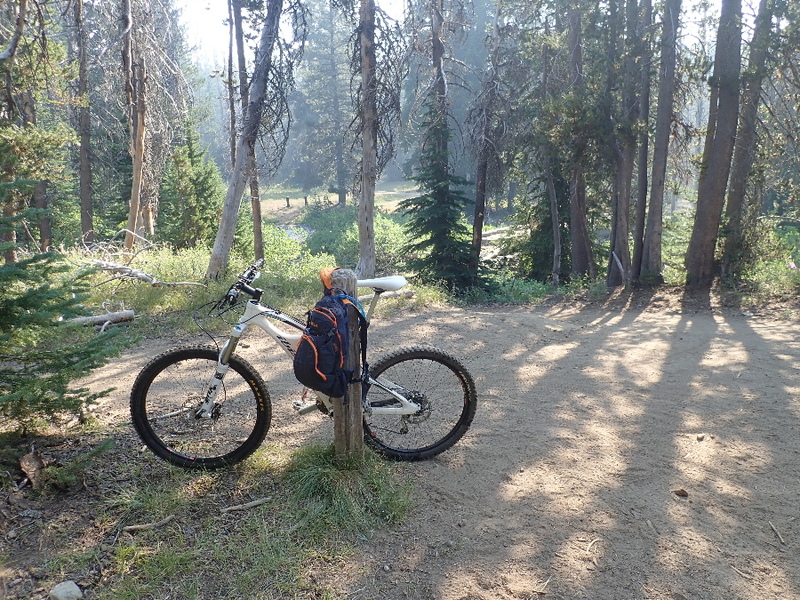 Yes, I had a plan and was aching to get out on the Ibis bike and go exploring in the hills. Rose went along and took a hike while I headed off on the North Fork Trail, then the Mrazek connector to Farewell Trail. 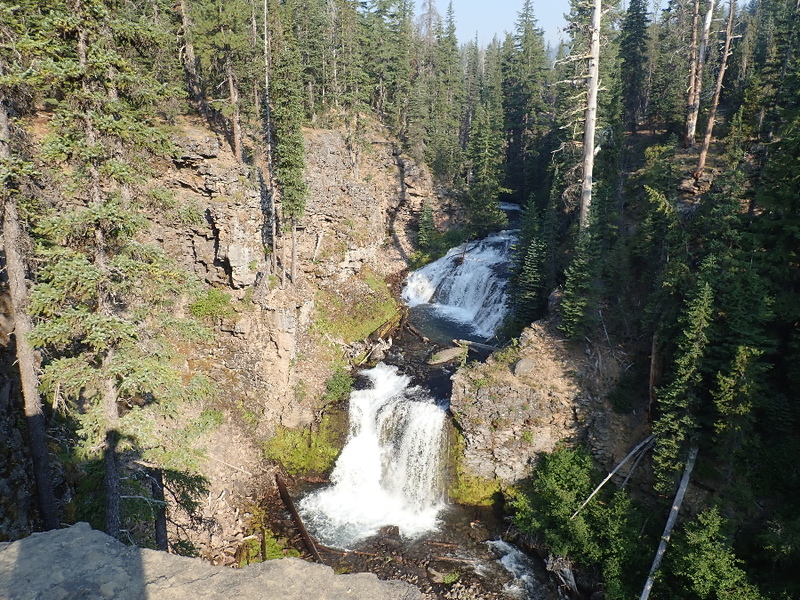 Tumalo Falls trail head at 8 am. Get up and go and on the road by 6:30am. Coffee on the road and we head down Hyw 97 to Bend. 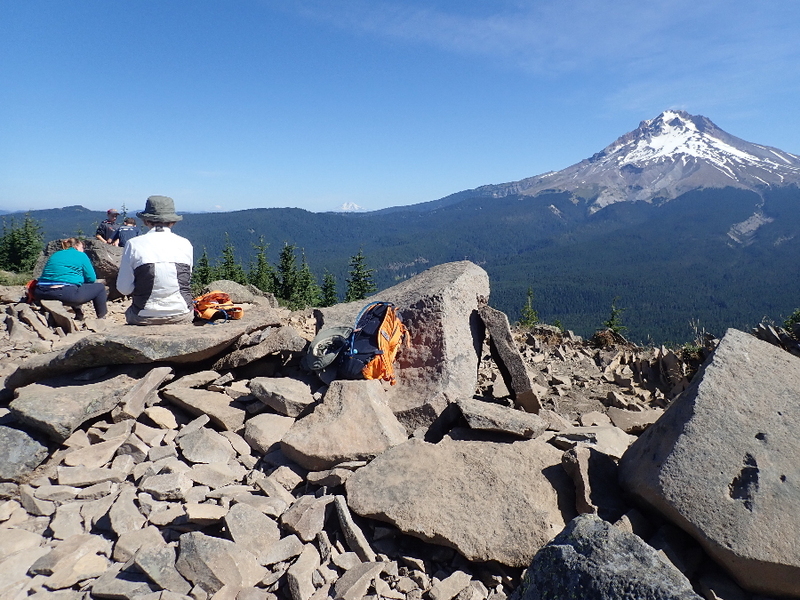 Then we head west into the mountains and surrounded by smoke from the nearby Sisters fire. I am getting disillusioned as we seem to be the only car on the deserted road. But it lifts a bit and we even see some roadies out for a ride. 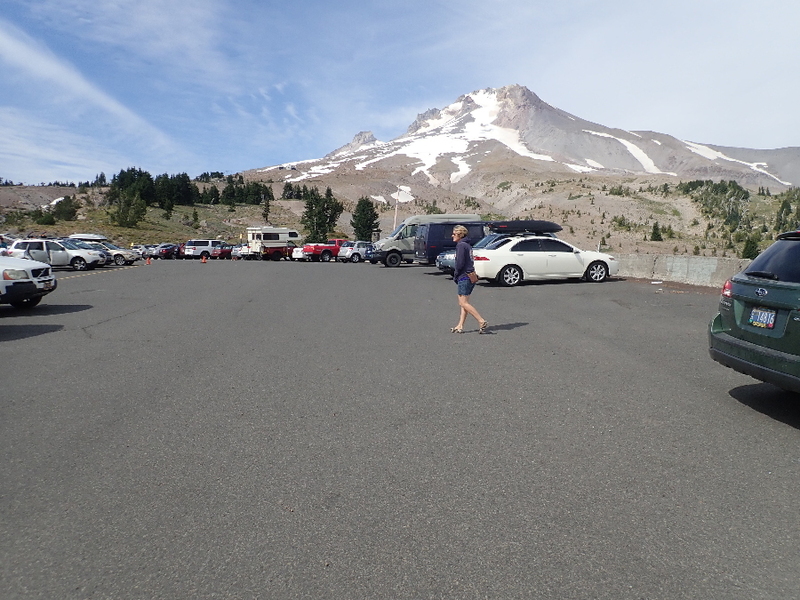 Find an almost empty parking lot and I look for locals to reassure me as to what my plan was. 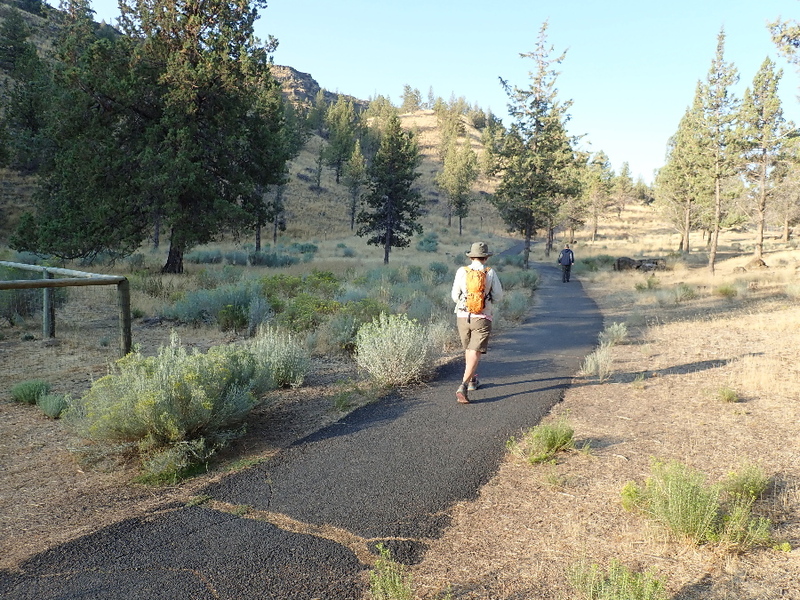 First a trail runner that has already completed the 10 mile loop I was setting out on. 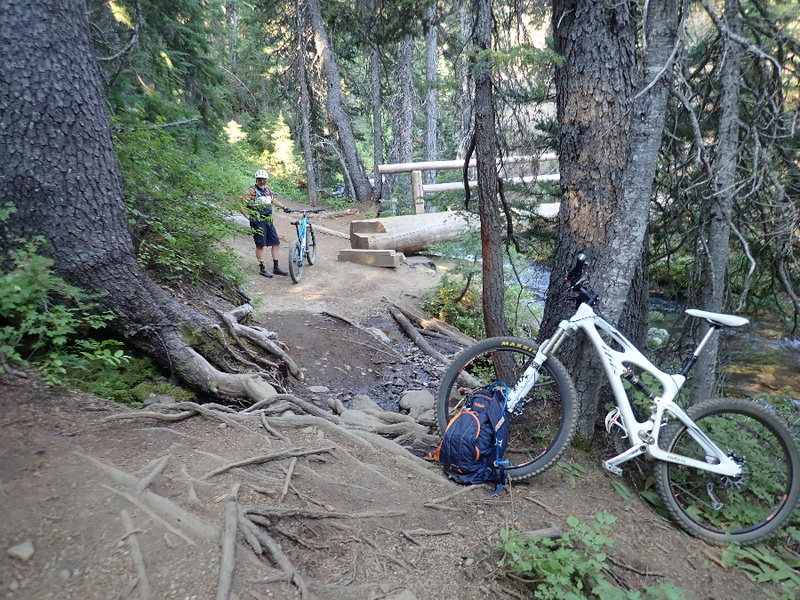 Then another mountain biker that showed me the start of the trail, usually the most difficult piece of navigation for a first timer like myself. Down to the river, you can see the smoke in the background. 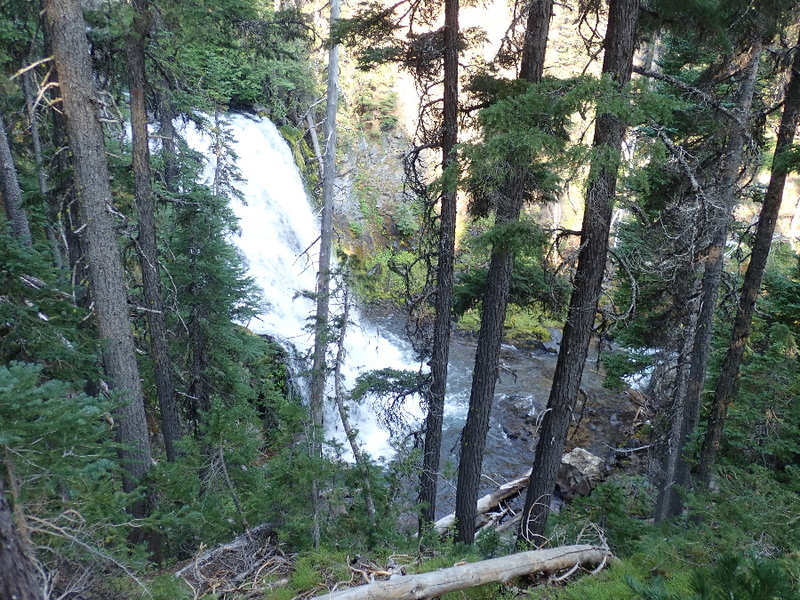 Trail is hard pack dirt and climbs nicely for 4 odd miles through the forest with plenty of overlooks to the river and water falls below. Riding solo I most probably head out too fast and soon find myself breathing hard to tackle the little kickers full of roots and other little obstacles. The excuse to stop and look at the views gives me time to recover my breath and push on. I stop to negotiate a bunch of tree trunks and take a photo only to be surprised by two other riders coming up behind me. 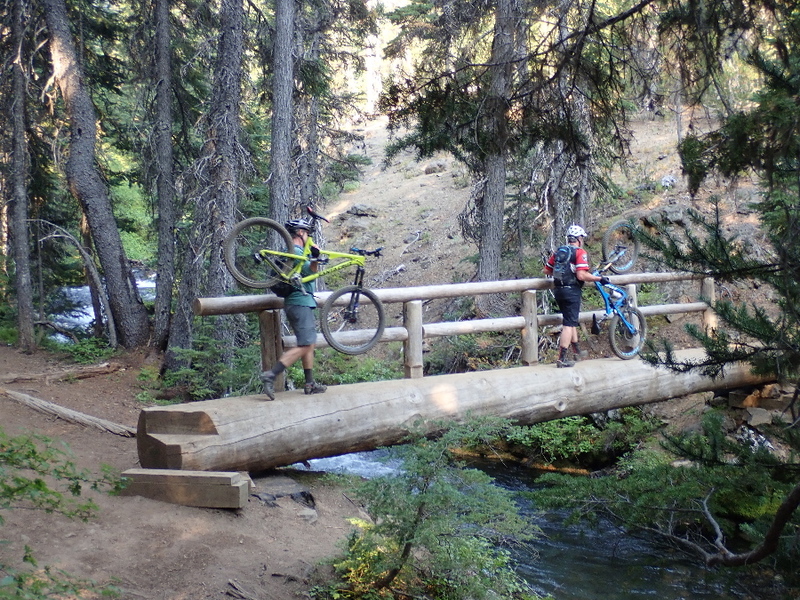 We chat for a while and they take off in front of me carrying their bikes across a log bridge. Don’t want to ride this one. 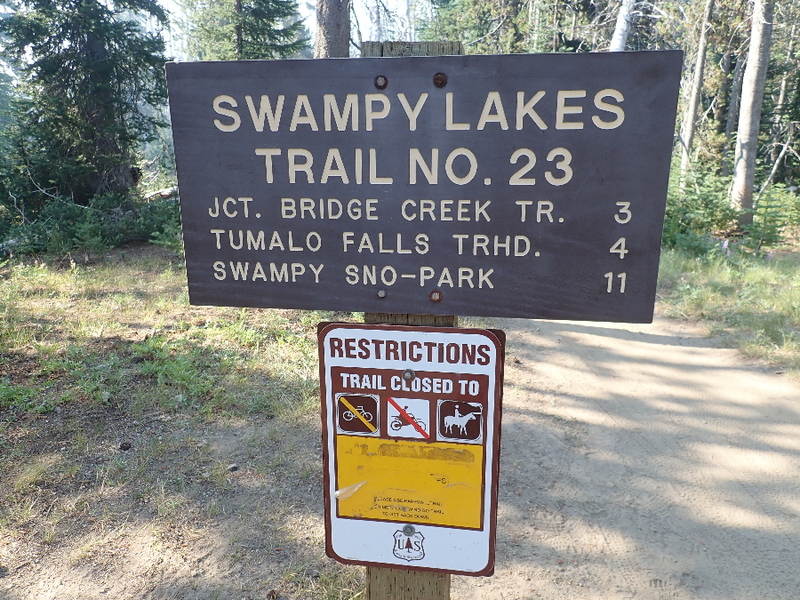 Don’t know about Swampy Lakes but I have just come up from the Tumalo Falls Trail Head. The reason that the rear looking sign says “No Bikes” is that is “uphill only” for bikes. 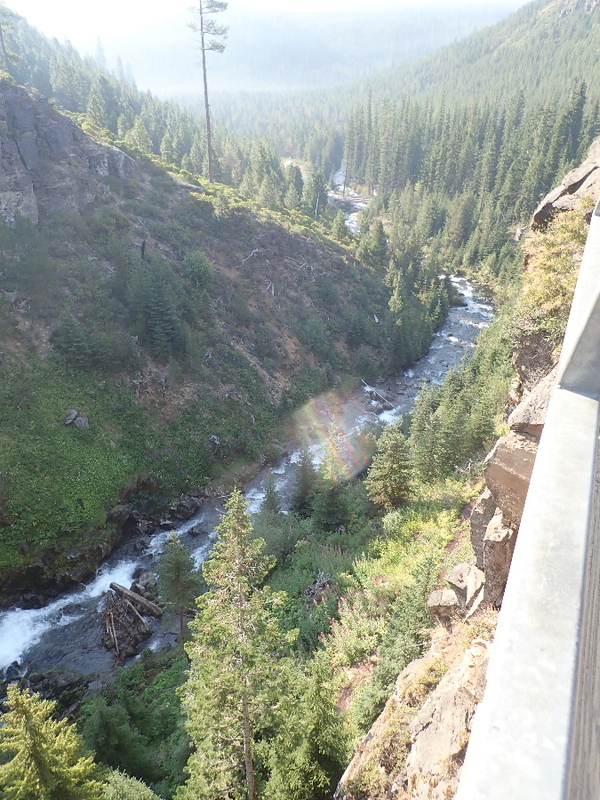 At the junction of Tumalo Falls and Mrazek I catchup with then again and they set me straight for the rest of my ride. 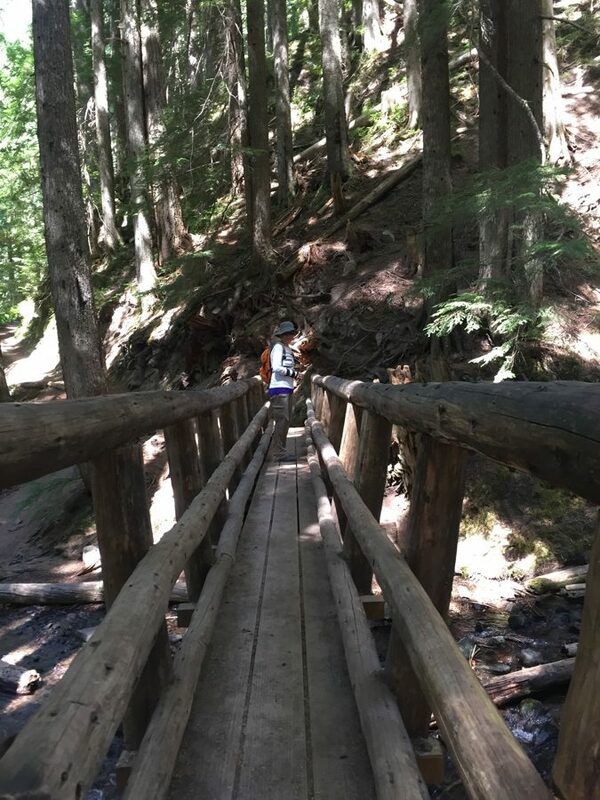 “Over the bridge and head up till you reach a fire road”. 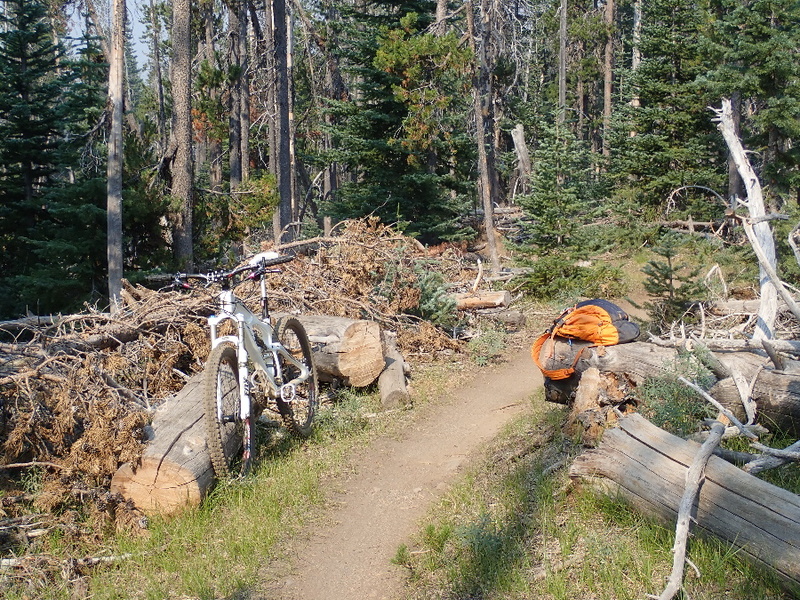 Starting to descend my fear becomes whacking a pedal against one of the plenty of logs crisscrossing the trail. 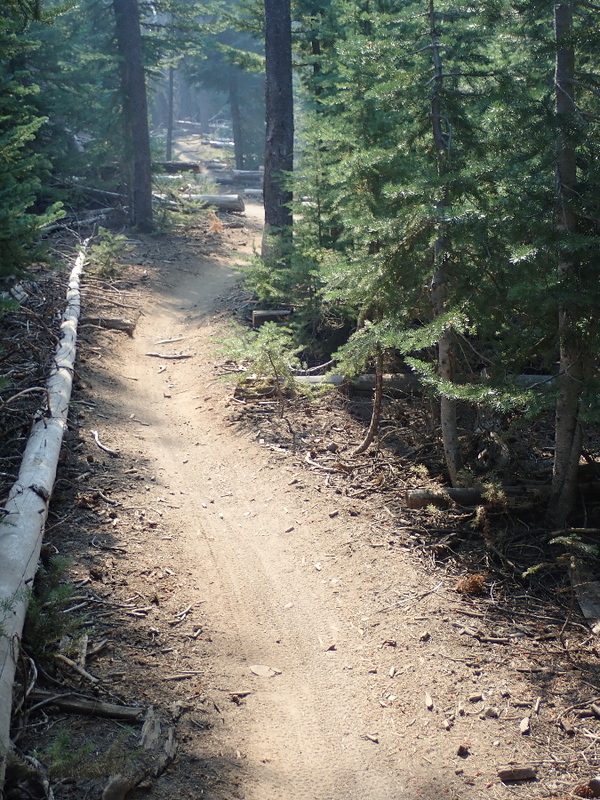 Some nice smooth banked curves through the trees. 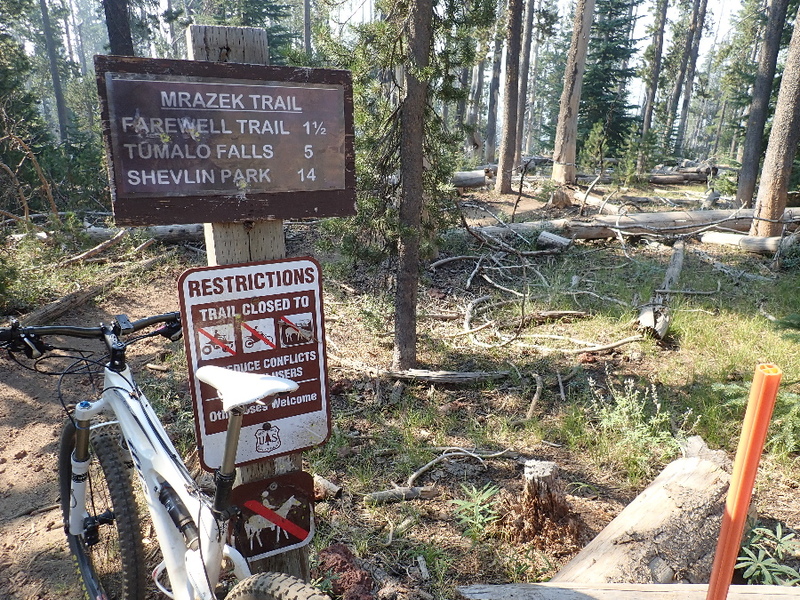 The trail becomes Farewell and drops steeply back to the trail head. I guess I was hanging on to negotiate the rocks and the camera stayed out of harms way. Back at the start the place was mobbed, I did not believe it was the same place we had started from. Headed for home and made a stop at Trader Joes to stock up for the next four days. Start of the Tam-a-lau trail. Saturday we hiked the Tam-a-lau trail from the campground, another 7 miles round trip. 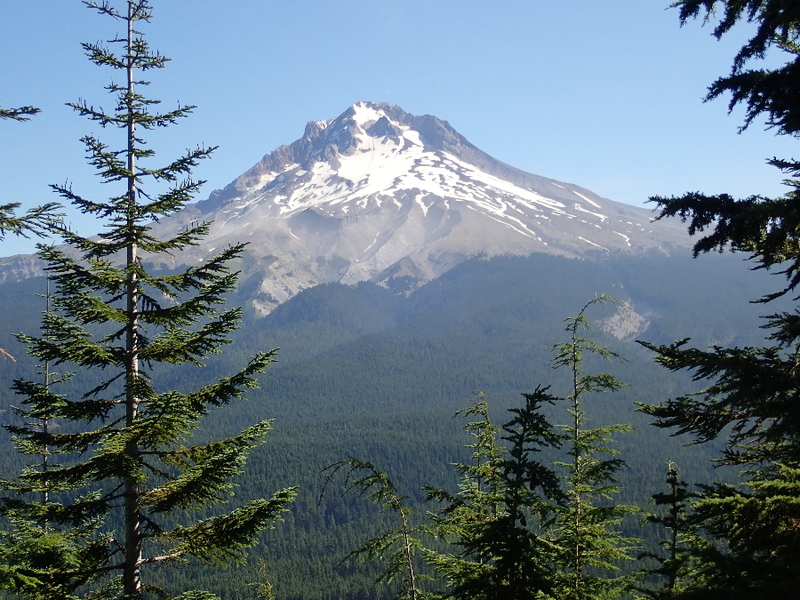 Climbs 600′ up to a plateau (mesa) or peninsula as they call it. 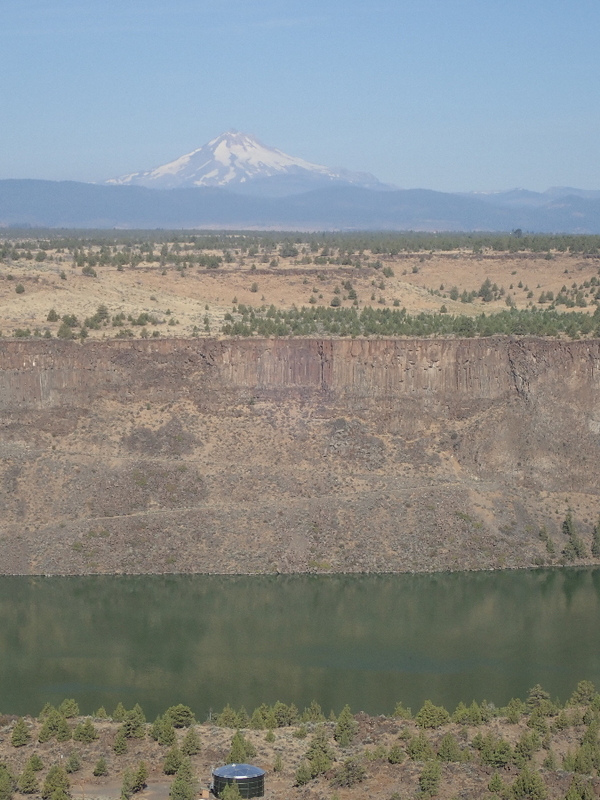 Looking out over the Crooked River arm. 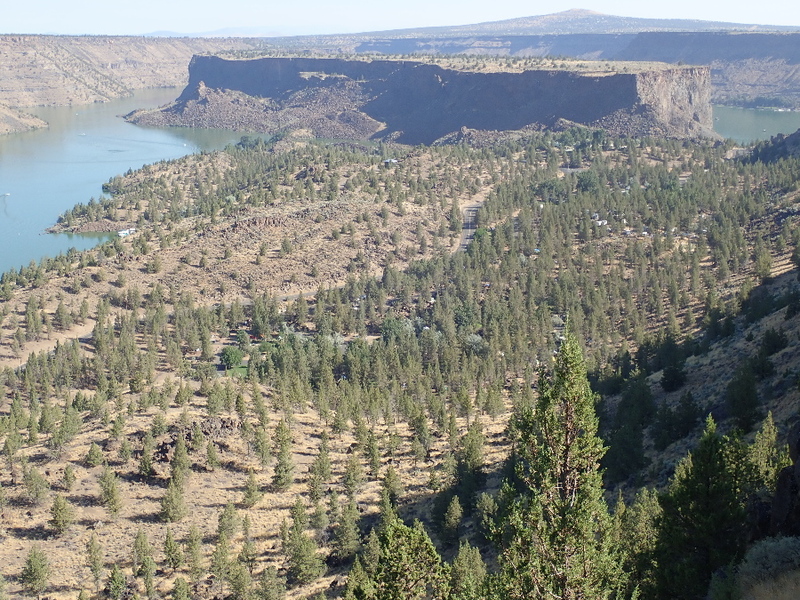 The Deschutes arm and our campground hidden in the trees on the middle left. Next Next post: 2 Minutes is all it takes!